10 miles on the mountain road, 35*, 70% humidity, 20+ mph wind blowing, snow falling, no fun day Running. 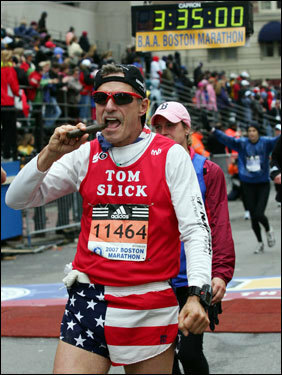 46 days till the Boston! 5 easy miles and a full body workout. 3 easy miles and a full body workout. 11 miles on the mountain road today. 40*, 34% humidity, lots of sunshine, 41 days till Boston! 10 more miles on the mountain road ..
5 easy miles, 60*, 10 mph wind, 38* humidity. Gym workout, 400 sets & crunches. 10 miles on the mountain road, 64*, 35% humidity, sunny skies, 6 mph wind. 37 days and a wake up and it’s time to run The Boston !!!! Total rest/recovery day off....35 days till Boston!!!!! 12.5 mi./ 2 mi warm up - 7mi (14X800) - 3.5 cool down. 6 miles on the big block and then a full body workout at the gym. 11 mi on the mt rd, 34*, intermittent rain, snow and wet roads, no sunshine. 6 mph winds. 87% humility w/ fresh snow on the ground. 8 mi on the mt rd. 42*, mostly cloudy skies, 16 mph winds, 40% humidity. 31 days till Boston!!!! 10.25 miles. 2.5 mi WU - 5 miles @ MP- 2.75 miles cool down50*, 27% humidity, 9 mph winds, partly sunny. 27 days till Boston! 12 miles up the MT Rd over the top and down wasatch to home base. 52*, 21 mph winds, mostly cloudy, . 26 days till the greatest run on earth ! 5 easy miles on a perpetual rainy day, it just won’t quit, then a workout and steam at the gym. Hope it’s a bit dryer tomorrow......55*, 22 mph winds, 70% humidity. 13 miles all over the place. 52*, 52% humidity, 8 mph winds, partly sunny. 22 miles on the Mt Rd & Porter Rockwell Trail. 33*, rain & snow, NNW 14 mph winds, 93% humidity, what a great run this one was? Everything was working as expected....Half of my miles today were at near marathon pace and the other half were at marathon pace! I think now that with a succsssful taper time, I am ready for the Boston Marathon ! The Boston is three weeks from Monday! 3 recovery miles today. 34*, 13 mph wind, 59% humidity, snow, wind& rain.. 21 days till Boston! 7 miles on the PRT....Yowzza, I really like taper time! 42*, 12 mph wind, 42% humidity, lots os cold & sunshine. 20 days and it’s Boston time! 9 miles on the Mt Rd today, 47*, 10 mph wind, 33% humidity, sunny but cold. 6 miles on the PRT....52*, 39% humidity, 12 mph winds, partly cloudy. 18 days till Boston. 5 miles on the big block. 55*, 9 mph winds, 30% humidity, mostly sunny.